200 Years from T L GREEN on Vimeo. This Friday 25th September, 7.30pm, St Teresa’s Hall, Heaton Road. NE6 5HL. A set of new songs written by Brenda Heslop in response to Keith Pattison’s photos of Easington in the 1985 strike. Projection of photos to a themes explored in song with the tight harmonies of the Heslop family. 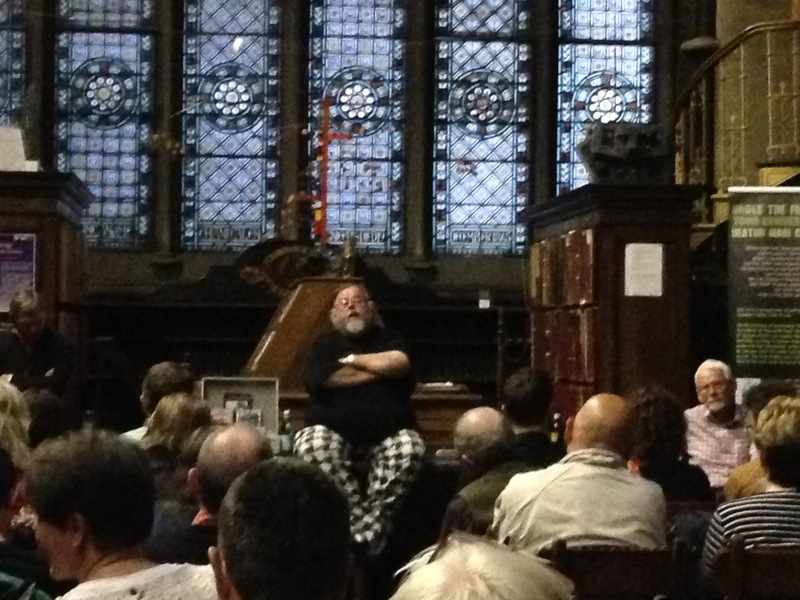 Geoff Heslop, noted for Rubber Records, Black Crow Records, has recorded many names on the Folk Circuit including Kathryn Tickle and Bob Fox and Stu Luckley. His guitar playing is now the foundation of the accompaniment of the three piece’s vocals. 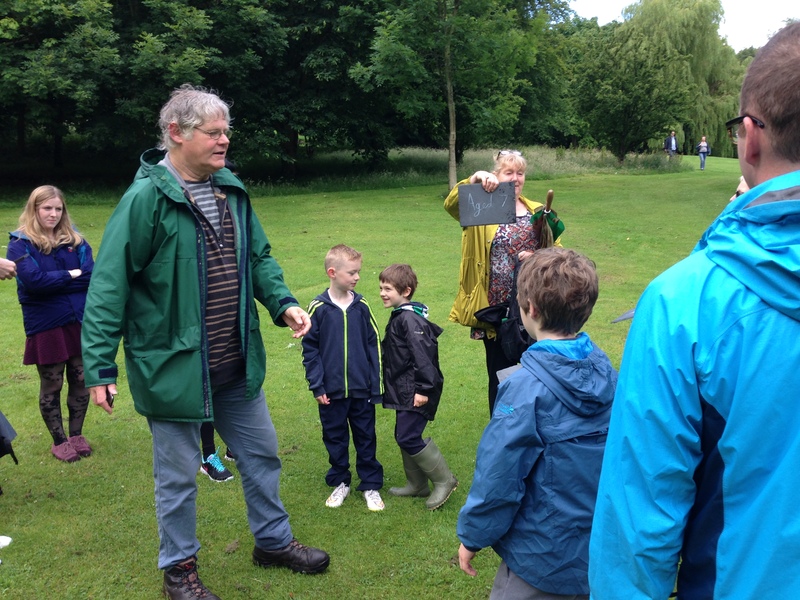 Peter Dillon and his film-making crew were out in Heaton Park this morning filming for the “Under the Fields of Heaton’ documentary film. Boys matching the age of the 34 boys lost down the mine in 1815, led a group of Heaton male residents in a ‘walk to work’ and a larger group of families walking to camera to commemorate the miners on the 200th anniversary of the disaster. Massed Choirs, Bands and Dancers at Ouseburn Festival! 5th July. 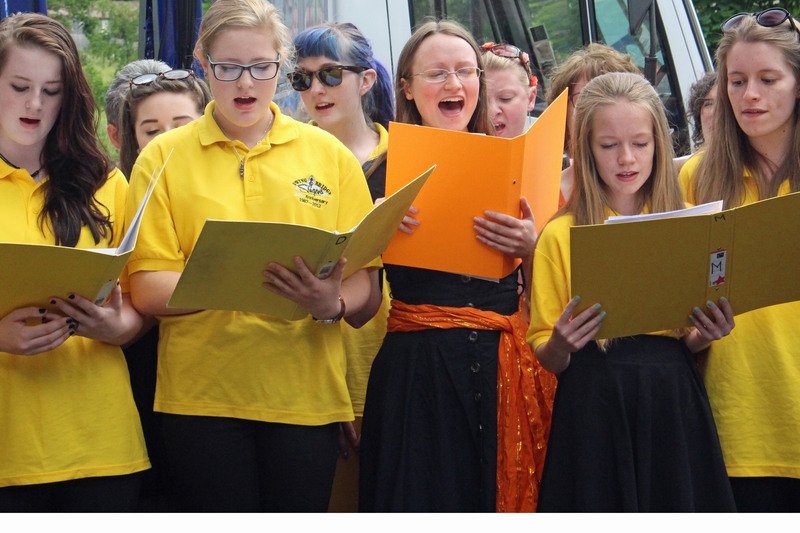 5th July, Sunday, was the culmination of months work with Flotsam, Heaton Voices, Caedmon Choir, North East Socialist Singers, Chilli Road Band, 10th Avenue Band, and Meze Mundo, all collaborating with guests, The Hexham Village Band and Hexham Morris. 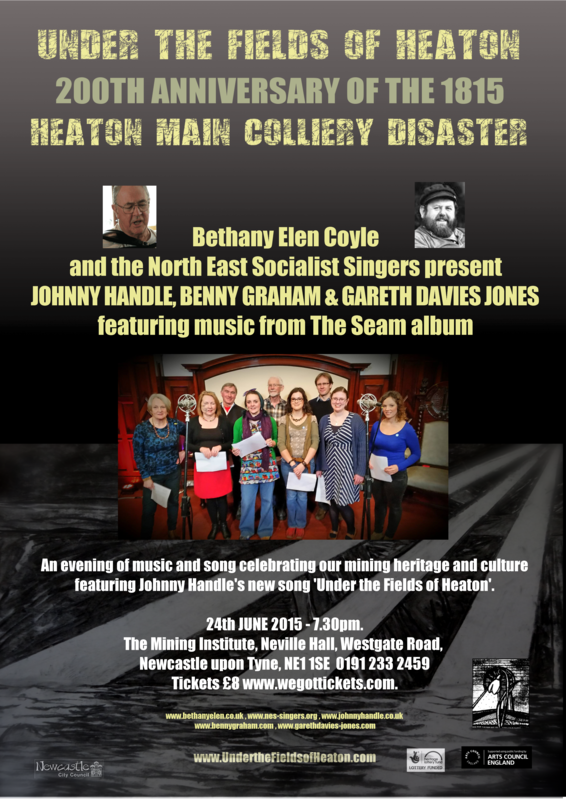 200 performed together, one for each year of the anniversary of the Heaton Main Disaster. The Suite was written and led by composers Johnny Handle, Ken Patterson, Andrew Scott and Richard Scott. 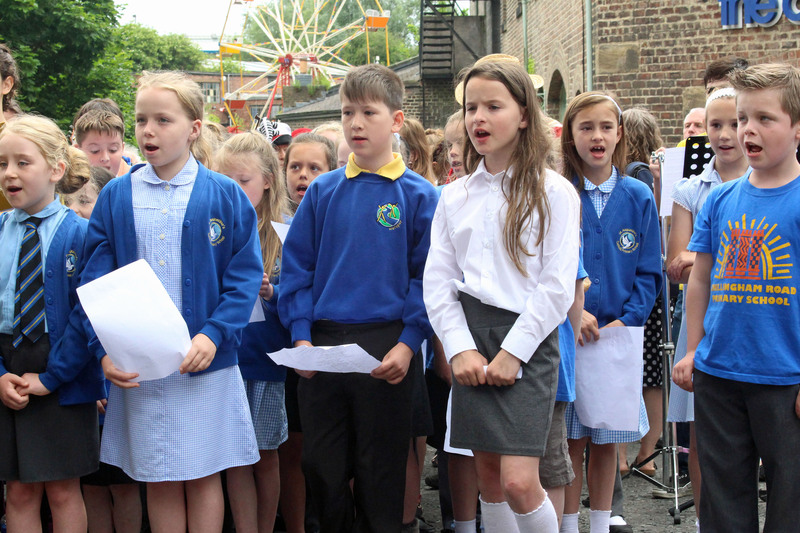 They gathered to perform the composition twice over at the ever increasingly successful Ouseburn Festival. 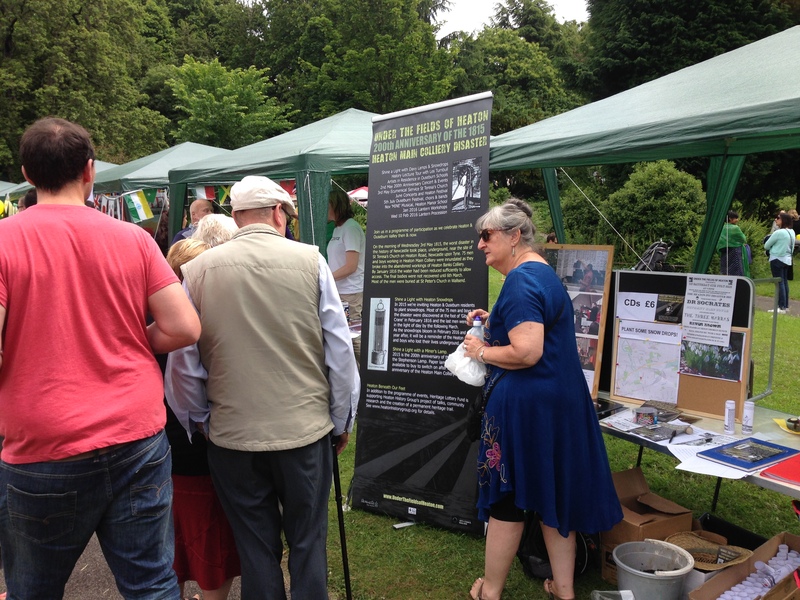 The 200th anniversary of the Heaton Main Mining Disaster was on 3rd May this year. The miners, 34 boys and 41 men, lay underground in flood water for nine months before being finally laid to rest in St Peter’s Churchyard in Wallsend. The Suite celebrates the start of summer with ‘the Sweets of May’ Morris Dance, to start the story of the 100 miners going underground on the Fore Shift. Johnny Handle’s ballad tells of the men escaping the press gangs for the Napoleonic War of 1815, only to be trapped at work. Exploratory digging resulted in the start of the flood at 4am: a gentle leak developing quickly into a torrent. 25 ran to safety, 75 ran to an air pocket that couldn’t have sustained them for long. 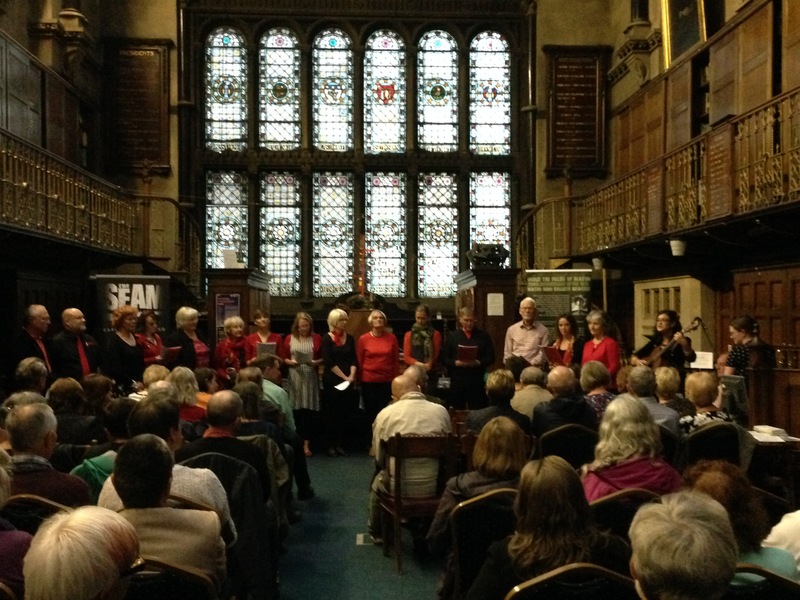 Andrew Scott’s Song, ‘The Heaton Trio’ tells of the hopes and fears of a mining family with three choirs within a choir: men, women and children. ‘Inundation’ is an instrumental improvisation with steel pans, saxes, brass, fiddles, flutes, drums and accordions each with their own them. Richard Scott’s song, ‘Waiting’ points to the long 9 month wait for the wives, mothers and families of the victims of the flood. John Buddle in a losing battle against the flood waters until the steam pumps finally cleared the mine. The finale, ‘Shafts of Light’, refers to Buddle’s efforts to change mining practice by specific mapping and recording of old workings. It was the thin divide between flooded and abandoned Heaton Banks Colliery which had been breached. With better data the disaster could have avoided. Singers, bands and dancers sing with optimism in an uplifting song based upon the folk dance tune ‘Jimmy Allen’ composed by Ken Patterson. There is a big demand expressed for a further indoor performance. The Under the Fields of Heaton working party are searching for an appropriate venue and time to mark the end of their programme of mining related events in February. Many thanks to the Ouseburn Festival! Many thanks to all the performers who worked hard to make the occasion so special. 4000 snowdrops now planted in 75 sites around the Ouseburn Vale to commemorate the 75 miners who died in 1815. 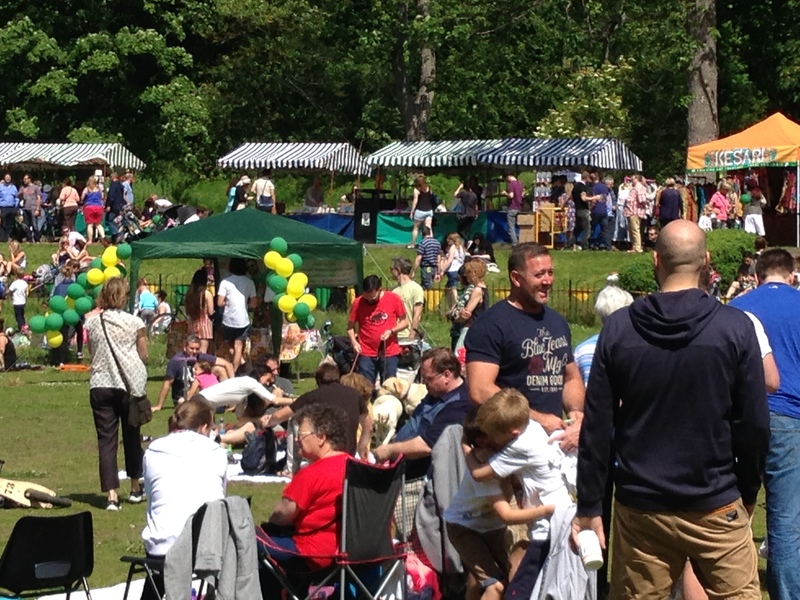 Thousands of Heaton residents turned out to celebrate their community at the Heaton Park Festival yesterday. Under the Fields of Heaton gave out 500 snowdrops to interested festival goers ….. and their snowdrop sites are now on the Snowdrop Map! These join 3500 snowdrops already distributed in schools, churches, and at the Spinney 2nd May remembrance event. 34 boys and 41 men were trapped underground under Heaton Park from 3rd May 1815 – February / March 1816 when their bodies were finally laid to rest. The newly planted snowdrops with bloom in February 2016 (and each year after) to remind Heaton residents of the 19C miners. A fine night of mining heritage. 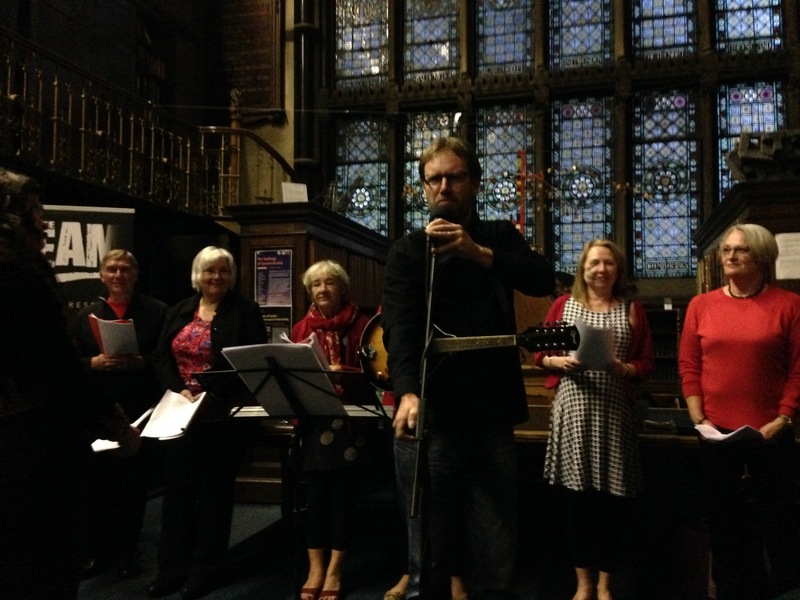 Bethany Elen Coyle put together a programme of songs old and new, put in context by Les Turnbull, sung by the North East Solidarity Singers, Bethany, Johnny Handle, Benny Graham and Gareth Davies-Jones. Bethany led the choir in the Durham Lockout with added poignant verses added for 21st parallels, Johnny joined the choir for ‘The Banner Song’, Benny started his set with ‘If it’s over the wall yer oot’, and Gareth sang a set of new songs from ‘SEAM’ researched and written at the MI and finishing with Gresford. Many thanks to organisers Bethany, Jennifer, Simon and all at the MI. Bethany Coyle’s special night of mining music on Wednesday! Tickets selling well….. don’t miss out! 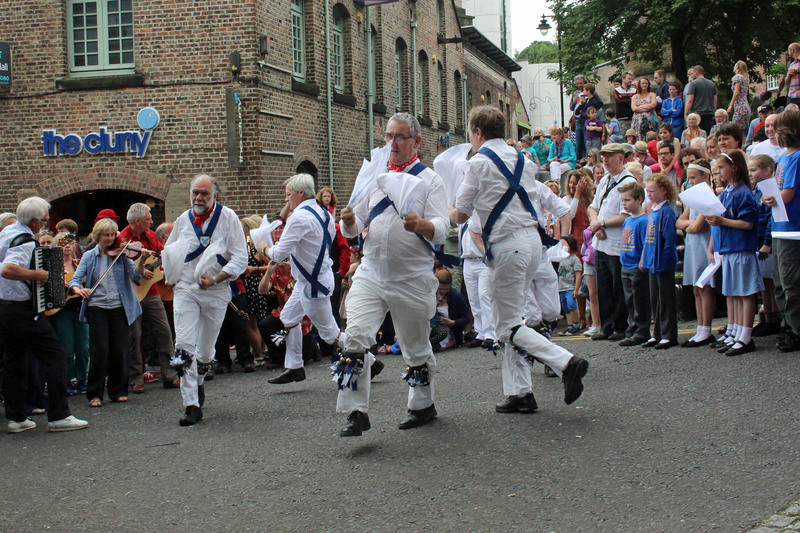 and Hexham Morris have started rehearsals for two big performances at the Ouseburn Festival! 12.15 outside Cluny and 2.15pm 5th July 2015 outside Cumberland Arms. 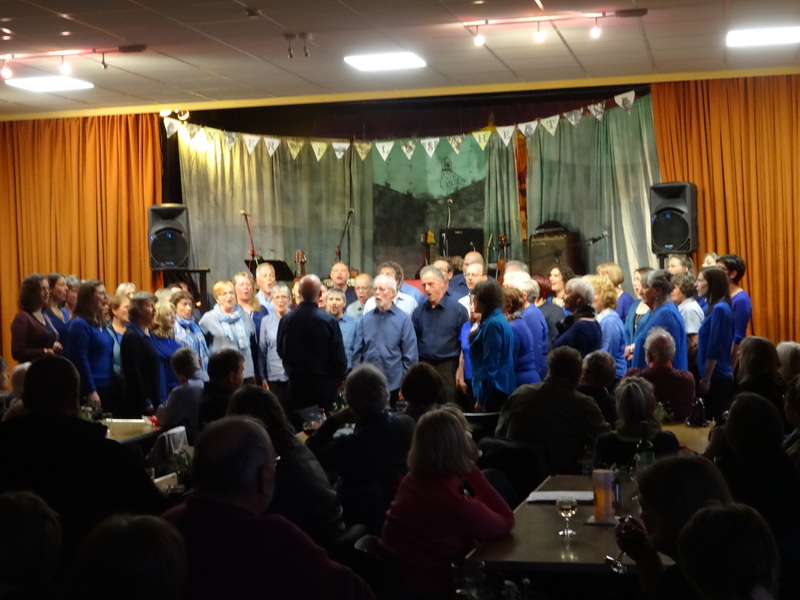 The massed voices and spectacle of local community choirs, bands, and dancers come together for the premier of a specially commissioned suite of songs and music to mark the 200th anniversary of the Heaton Main Colliery Disaster. 3 Combined choirs sing Andrew Scott’s ‘Heaton Trio’: the men, women and children.